With the model 6495 digital wheelchair scale, you get speed and increased accuracy that only electronic weighing can provide - weigh in lbs or kgs at the press of a button. 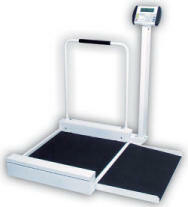 The weight display is mounted on a tilt mount which permits the indicator to be angled for easy viewing. A keypad for entry of known empty chair weights is also provided, thus giving the exact weight of the patient accurately and instantly in large 0.5" / 13 mm digits.